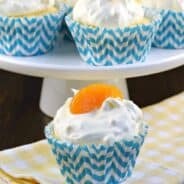 Light and refreshing, this Lemon Whipped Cream Frosting recipe is the perfect addition to homemade lemon cupcakes. Frosting can make or break a cupcake. In my mind, it doesn’t matter if you have the most delicious cupcake base, a bad batch of frosting and I’m out. 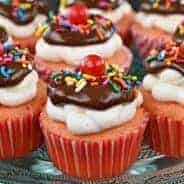 However, you can take a boxed cupcake mix and top it with a creamy homemade frosting, and suddenly it’s transformed into the best cupcake you’ve ever eaten. I had a friend recently request a homemade whipped cream frosting recipe. You see, unlike me, she’s not a big fan of overly sweet buttercream frosting. If you’ve noticed on some of my cupcake recipes, like these Carrot Cake Cupcakes and this Chocolate Chip Cheesecake Cupcake, you’ll see that I like to go big when it comes to frosting. I prefer equal amounts of frosting to cupcake. But apparently not everyone feels that way. Some people prefer a less sweet topping on their cake. 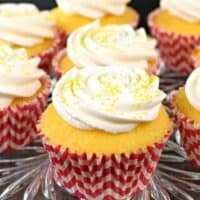 Years ago I made the most delicious Lemon Cupcakes you’ll ever try! 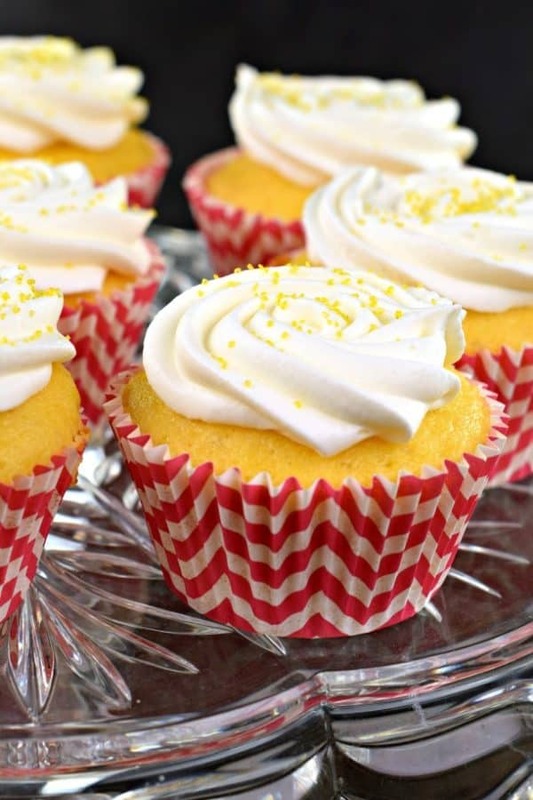 I topped them with the most amazing Lemon Buttercream Frosting you’ll ever eat. So today, I took that lemon cupcake and made a less sweet frosting…a Lemon Whipped Cream Frosting! Holy deliciousness, I’m kinda a fan of this treat. First, start with a clean mixing bowl (attached to a stand mixer or a handheld electric mixer). You’ll want to beat your heavy whipping cream for several minutes until thick. I did this for about 3 minutes using the whisk attachment on my mixer. Next, while it’s mixing, slowly sprinkle in the powdered sugar, lemon zest, and lemon extract. Do this over a matter of a 2 minutes. For my cupcakes, I wanted a frosting that holds up and would allow me to pipe it out of a pastry bag. I added 1 tsp of clear jel (<——I bought it on Amazon). Finally, keep the frosting and cupcakes REFRIGERATED. This will get soft at room temperature! What’s YOUR favorite cupcake and frosting combo? Share it in the comments, I always need recipe inspiration! First things first, the very best CHOCOLATE frosting recipe. We all need to have a go-to buttercream in our recipe boxes, and this one is my favorite! My friend Lisa makes the most amazing Cream Cheese Frosting! You’ll want this one to add to your red velvet cakes/cupcakes and carrot cakes! Have you heard of 7-minute frosting? Michelle makes this creamy, meringue like frosting with a marshmallow flavor. OMG it’s so good! For the holiday’s, you’ll want to pin this Peppermint White chocolate frosting recipe. It’s perfect on brownies! Cream Cheese Maple Pecan Frosting. I mean, does it get better than this? Perfect on carrot cake and pumpkin cakes! Thank you Karen for this recipe! In a large mixing bowl, beat heavy cream with a whisk (attached to a stand mixer or a handheld electric mixer) for 2-3 minutes until thickened. Slowly beat in the powdered sugar,lemon extract, lemon zest, and clear jel. Beat an additional 2-3 minutes until desired consistency. 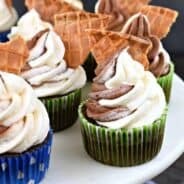 Frost cooled cupcakes and refrigerate for one hour. Serve cold and enjoy. Keep cupcakes in refrigerator for up to 3 days. 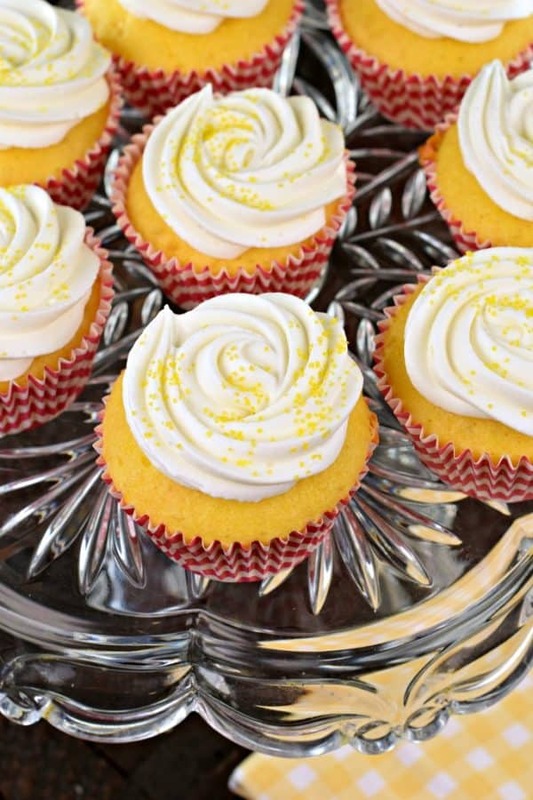 *I added 2 drops of yellow gel food coloring to my cupcakes to give them a bright color! This is optional. 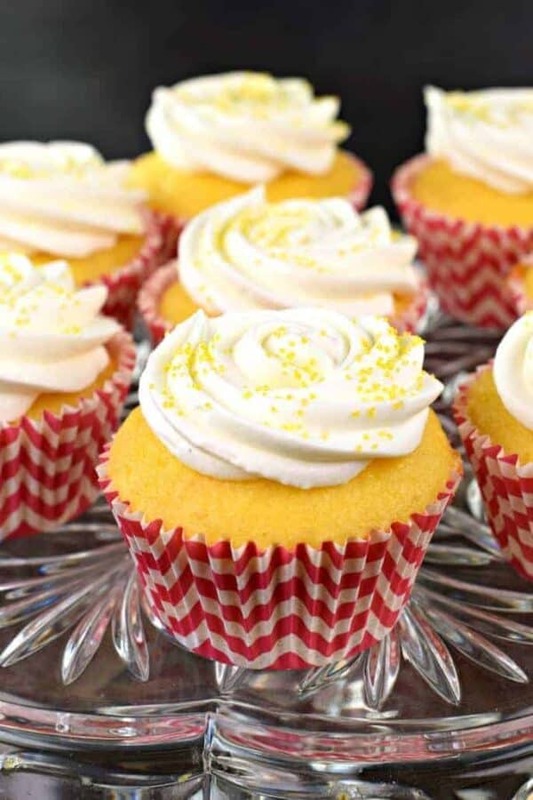 This frosting sounds so refreshing and perfect for spring time cupcakes. I’m a first time commenter on your blog, even though I have been following it for awhile. Please stop by my blog, I’ve just started so any support would be great. This is very easy process for making this lemon whipped cream, i am surly trying to make this cream in my kitchen.